Theocracy are finally back with their new album "Ghost Ship", featuring 10 powerful new songs that showcase the epic, heavy and melodic sound the band is known for, Ghost Ship is the followup to 2011’s As the World Bleeds and 2013’s self-titled debut remix. With Ghost Ship, Theocracy perfects the lively and fully-realized sound of As the World Bleeds, delivering 10 muscular and streamlined tracks that never lose focus and combine for one memorable journey. Each song on Ghost Ship stands alone and has a unique signature, but every moment sounds unmistakably like Theocracy. Theocracy started life as a one-man project by Matt Smith in Athens, Ga., though their style has more in common with their European contemporaries than with most of their U.S. counterparts. Characterized by huge choruses, epic arrangements and progressive elements, Theocracy’s music is both immediate and deep, managing to be instantly catchy and memorable, yet revealing new levels of intricacy and depth with each subsequent listen. The self-titled Theocracy debut album was released at the end of 2003 on MetalAges Records to fantastic reviews and worldwide acclaim within the metal community. After its release, the band began playing shows (including the prestigious ProgPower USA showcase) and started working on new material. After years of hard work, Theocracy signed with Ulterium Records and released their second album Mirror of Souls in 2008. Mirror of Souls was a huge breakthrough for Theocracy, and received fantastic reviews from press around the world. 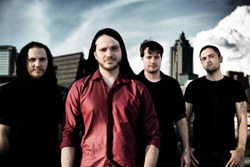 The album was released in Europe, North America and Japan, and in addition to U.S. shows opening for bands like Sonata Arctica, Blind Guardian and Circle to Circle, Theocracy also embarked upon their first European headlining tour in the fall of 2009. In 2011, Theocracy released their third magnum opus, entitled As the World Bleeds, which hit the Billboard Heatseeker Chart at #40 in the U.S. and received a fantastic response all around the world. In the fall of 2011, Theocracy returned to Europe for a second headlining tour, followed by more shows in the U.S., a festival appearance in Finland, and the band’s first show in Costa Rica. By 2013, the self-titled debut album from Theocracy had been out of print for several years, and fans were constantly asking for a re-issue. In order to improve upon the drum machine and amateur production of the original release without losing the charm of the recordings, Theocracy drummer Shawn Benson recorded drums on all tracks, while nothing else was re-recorded. Matt completely re-mixed the album, with the mastering handled by Mika Jussila, and the debut was re-released on Ulterium Records.